Winter Halo by Keri Arthur – The second book of the Outcast series, and sequel to City of Light which was my first ever book by Keri Arthur. I loved it, which is why I’m really looking forward to reading more. My thanks to Signet for the surprise ARC. An Import of Intrigue by Marshall Ryan Maresca – And speaking of exciting sequels, this second book of the Maradaine Constabulary series is pretty high on my list of anticipated titles this fall. In October, Marshall Ryan Maresca will also be stopping by The BblioSanctum on his blog tour, so stay tuned for that and a giveaway! Thank you to DAW books for the opportunity. Confluence by S.K. 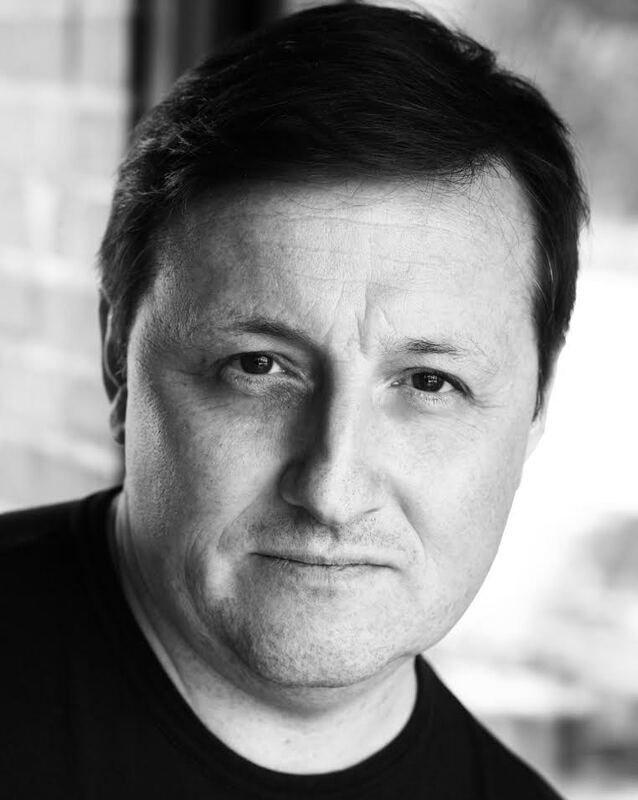 Dunstall – This was a surprise arrival, but it reminded me that I really should get cracking on starting the Linesman series. It’s already the third book! Maybe I’ll binge all three this November during Sci-Fi Month. With thanks to Ace Books! The Rift Uprising by Amy S. Foster – More sci-fi goodness! 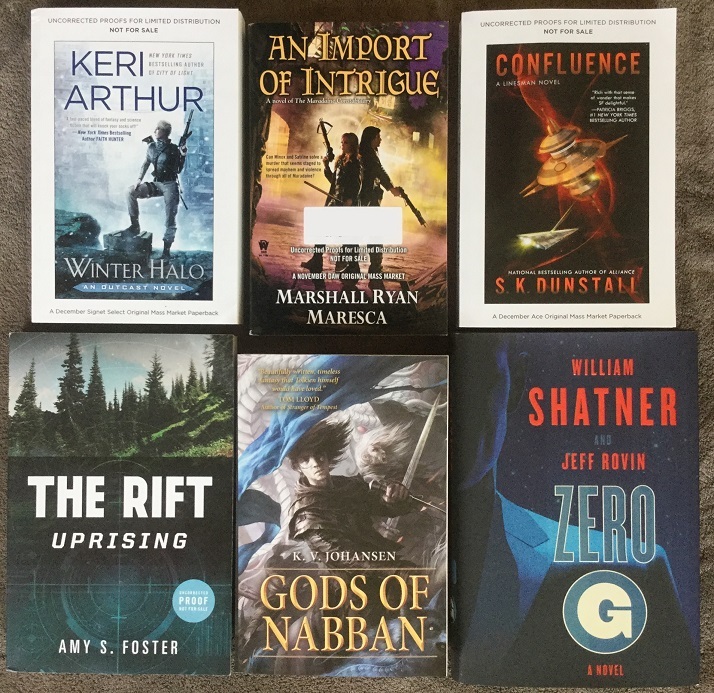 Thanks to the kind folks at Wunderkind, I was offered a chance to check out famed songwriter and lyricist Amy S. Foster’s first book in her Rift Uprising trilogy, out from Harper Voyager this October. 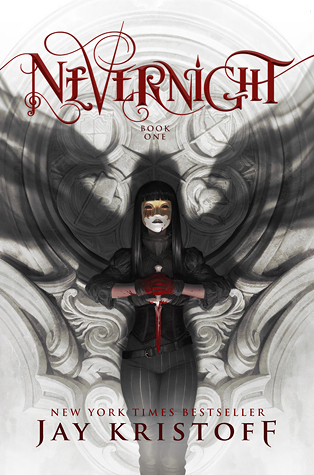 It looks to be a great one, and has crossover appeal for both YA and adult readers as well. Can’t wait to read it. Gods of Nabban by K.V. 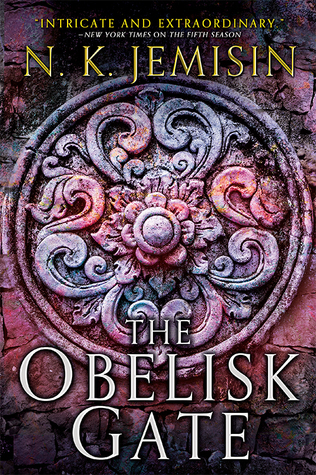 Johansen – Thank you Pyr Books for this finished copy of book three in K.V. Johansen’s Marakand sequence. I’m told it can be read as a standalone without reading the previous two books, but since I’ve already read The Leopard, I probably should catch up with The Lady before diving into this one, just for completion’s sake! Zero G by William Shatner and Jeff Rovin – Everyone’s heard of William Shatner, though most probably have not read his books. I haven’t either, but color me intrigued when this book showed up on my porch last week. I’m really curious about the premise, and definitely wouldn’t mind giving this a try. My thanks to Simon & Schuster. A Shadow Bright and Burning by Jessica Cluess – A surprise package arrived from Random House a few days ago and this was inside, which was pretty exciting! 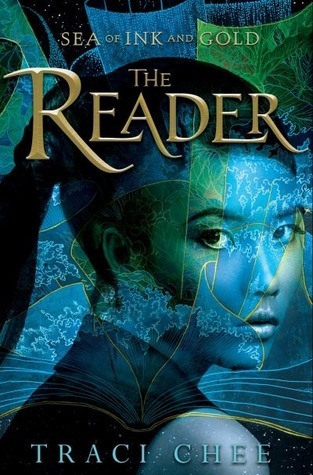 I’ve been hearing buzz about this YA fantasy for quite some time now, and I’m actually pumped about checking it out. Thank you to Random House Books for Young Readers for the ARC. 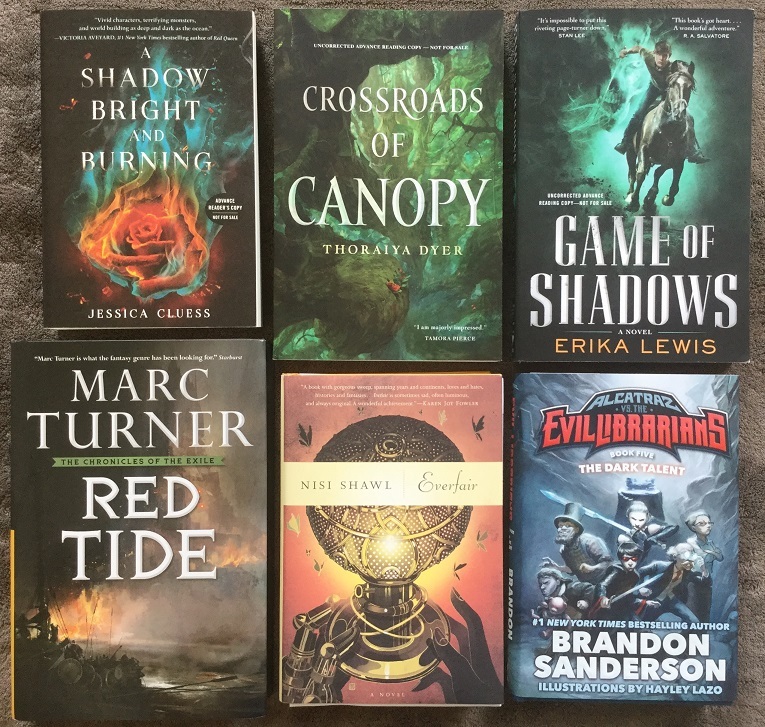 A huge thanks to Tor Books for the following awesome review copies received: first up, a surprise package was delivered a couple weeks ago containing not one but two upcoming titles for early 2017, Crossroads of Canopy by Thoraiya Dyer and Game of Shadows by Erika Lewis. These books have been peripherally on my radar for a while, but their arrival prompted me to do some further research and I really like the sound of them. Needless to say, they’re now both considerably higher on my to-read list! Also received were several finished copies. Red Tide by Marc Turner is on tap for later this month, since I enjoyed the first two books of The Chronicle of the Exile and there’s no way I’m missing out on the third installment. Everfair by Nisi Shawl is also one of my most anticipated titles for this fall, so I hope to get to that as soon as possible. 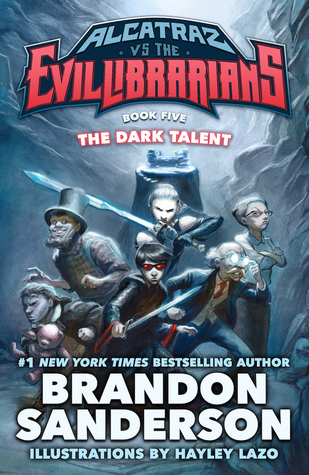 Finally, The Dark Talent by Brandon Sanderson has already been read and reviewed, and you can find the link below (my review was also updated, as there have been some interesting developments since the post originally went up)! 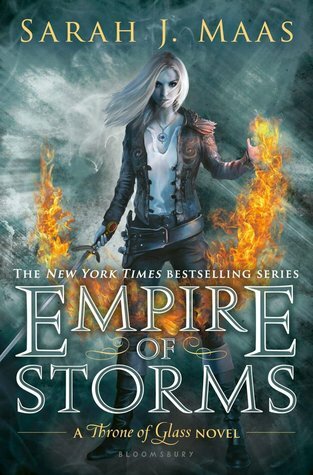 Empire of Storms by Sarah J. Maas – Audiobook, with thanks to Audible. I listened to the audio editions for books one through four as well, so naturally I have to to carry on that tradition with book five. It’s true I’ve had my ups and downs with the Throne of Glass series, but there’s just something about these books that make them so hard to quit! Prince Lestat and the Realms of Atlantis by Anne Rice – That’s right, another Anne Rice book is coming out soon. 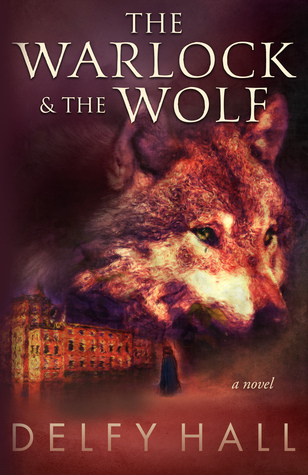 I was thrilled to be approved for the eARC of this follow-up to her 2014 novel Prince Lestat. 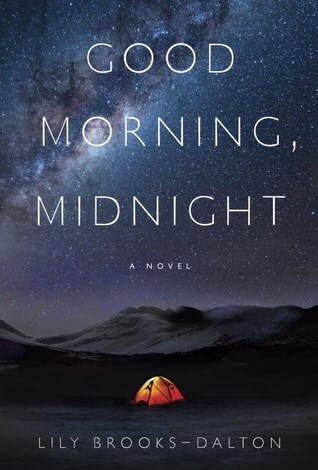 You could say I’m an on-again-off-again fan of Rice, since she’s gone through so many different styles in her celebrated career, but I’ll never say no to an opportunity to read her books since you just know anything she writes is going to be pretty interesting. My thanks to Knopf via Edelweiss. 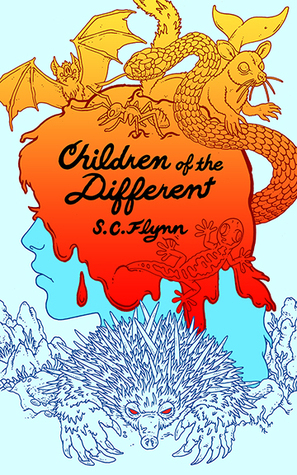 Children of the Different by S.C. Flynn – My thanks to the author for providing me with the audiobook for review. I hadn’t known that an audio edition for this book even existed until a few days ago. Life has been crazy lately, so I have a lot less time to actually sit down and read. On the other hand, I can always find opportunities to listen to books while running around, so I was really glad! Review roundup time! Here are the books I reviewed since the last update. 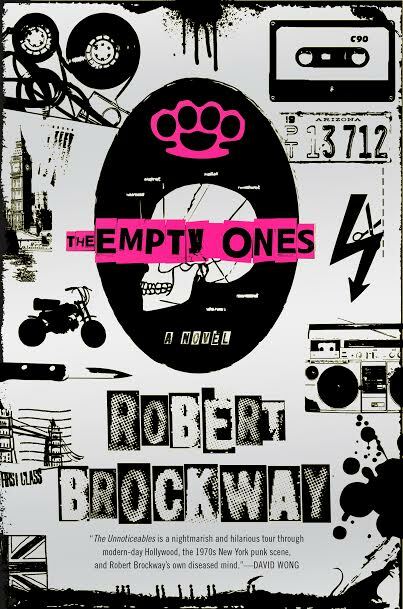 The coveted feature spot goes to none other than The Empty Ones, which was such an awesome read! Big thanks to the special guests who stopped by The BiblioSanctum these last two weeks! Here’s some of what I’ll be reviewing at the BiblioSanctum in the next few weeks (minus the reviews that are already up). By the end of the month I also plan to have read all six potential finalists in The BiblioSanctum’s original list of thirty entries for SPFBO, and as you can see I’ve already started. We’ve also made a page for SPFBO 2016 where we’ll be keeping track of all the info and updates, so if you want to know what the competition is all about, that should help catch you up! 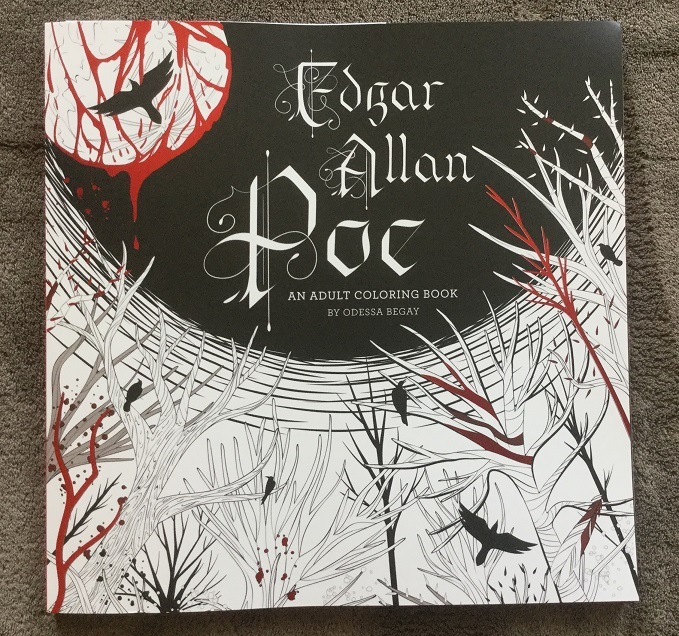 I had a chance at the Poe coloring book – I’m kicking myself for not grabbing a copy. All I can do is shake my head at Prince Lestat and the Realms of Atlantis. Prince Lestat was such a disappointment for me that I can’t imagine reading another. I’ll be honest, I wasn’t blown away by Prince Lestat, but it was actually far better than I’d hoped it would be. 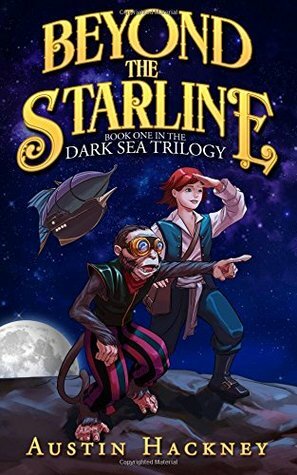 After her werewolf series a few years back (which was really…blah) I was worried Prince Lestat was going to go the same way, but I was pleasantly surprised. I thought I would give her next Lestat book another try. Nice! Seems like a lot of people are getting Winter Halo! 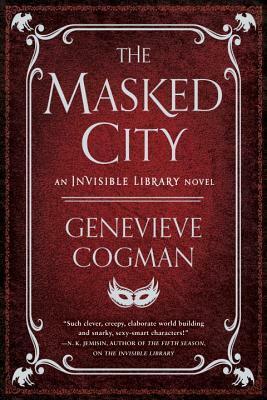 I am so behind on my review books I’m trying not to request more from Netgalley and such! At least for awhile! LOL! Hope you enjoy all the awesome new reads! I still need to read ASBAB as well and am hoping to do so soonish. Happy Reading! Also, just wondering if anyone from Bibliosanctum is planning to read / review Steeplejack by A.J. Hartley? I’m 75% though it now, and it’s REALLY good! I have a copy of Steeplejack, but since it was a surprise arrival, I haven’t had a chance to get to it yet. 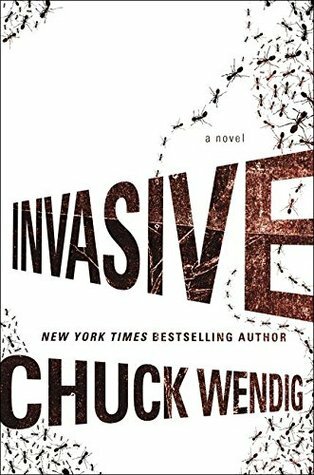 It’s on my to read list though, since everything I’ve heard about it has been very positive, and I just saw your rating on GR! Hopefully when things quiet down a bit, I can fit it in, because I really do want to check it out! 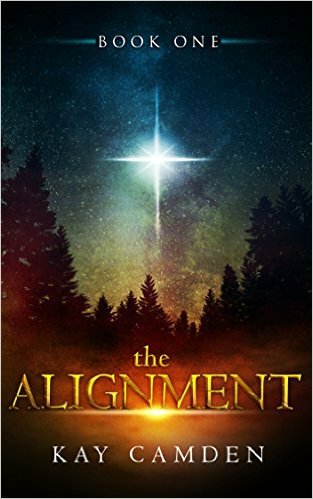 I’ve seen A Shadow Bright and Burning popping up everywhere lately – I’ll be interested in your assessment! 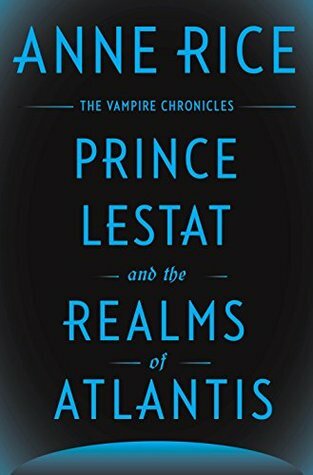 Color me completely flabbergasted that a) there is another Anne Rice Vampire book coming out and b) it pairs Lestat and Atlantis? What?! I think you said it best – she has gone through so many styles. Anyhoo, I can’t wait to see what you think of her latest offering!! I loved Interview with the Vampire and the Vampire Lestat. But Rice lost me with Queen of the Damned. I’m surprised that she’s still writing in this series! A Shadow Bright and Burning! That one looks so great. Here’s hoping it can live up to the buzz. I was shocked too, when I heard about her last book Prince Lestat. Looks like she still has more vampire chronicle tales in her! Thanks for mentioning CHILDREN OF THE DIFFERENT – I hope you enjoy the audiobook! Ugh, I need to stake out your mailbox, clearly. You get so many awesome books! 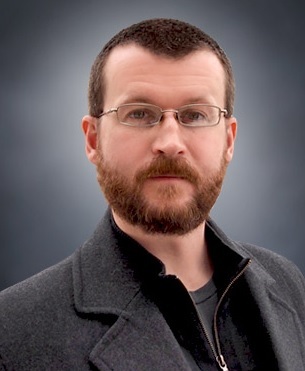 I just saw someone talking about The Rift on Booktube yesterday. Now that I’ve seen it again, maybe fate is trying to tell me I should check it out (hey, it’s as good an excuse as any). I’ve read some Anne Rice books and for the most part like them. However, I’ve never been able to get through Interview with a Vampire. I enjoyed the witches series and started the wolf series (which I really liked but will have to reread if I want to continue). I still can’t believe I see Anne Rice, vampire and Atlantis on one cover. Sounds pretty odd if I have to be honest. I will be interested to see some reviews of thsi one. I was the opposite with Rice, I enjoy her vampire books (well, MOST of them, heh!) but couldn’t really get into her werewolf series a few years back. I still need to try her witches books though, I hear that ones’s great. I am trying to read more SF (to improve my SF vs F balance). So I appreciate the SF titles you have listed, there were a couple I hadn’t heard of yet. I’m really curious about Everfair!! 🙂 And I am in love with that coloring book! Hoping to get to Everfair soon. And get my coloring book on later this year! I saw the Anne Rice book and was very tempted to request it but in fairness I have only read the one book from this series so I thought I’d best not! Happy reading. Some great looking books to look forward to on here. I think the vampire books are generally stand alones. I haven’t read all of them either, just one here and there following some of my favorite characters. I don’t think you’ll be too lost, but I understand trying to control that TBR! Oh My! A Poe colouring book!! It looks phenomenal! I must have it 😀 Gorgeous haul all around as usual Mogsy^^ Enjoy!! Seriously, I can’t wait to try my hand at coloring that Poe book! The drawings in it are dark and macabre indeed!